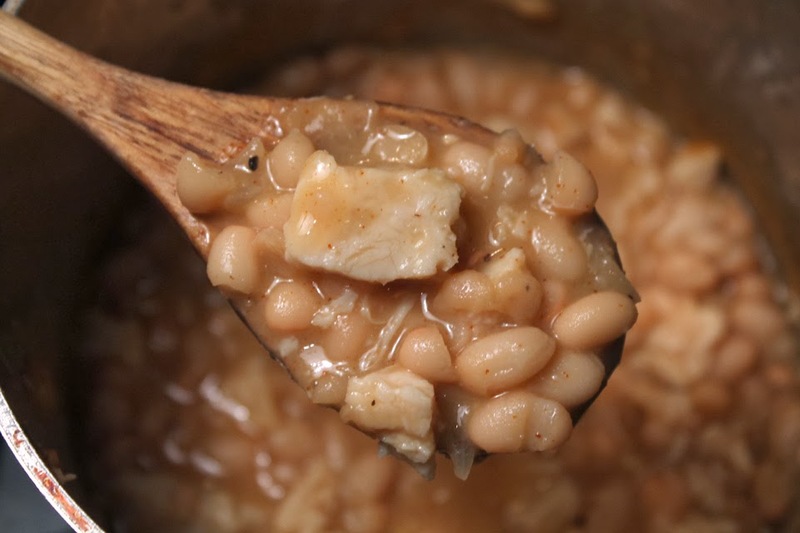 The most flavorful pot of beans you'll ever cook up is featured in the Cheap$kate Chef's latest stop motion animated video recipe. 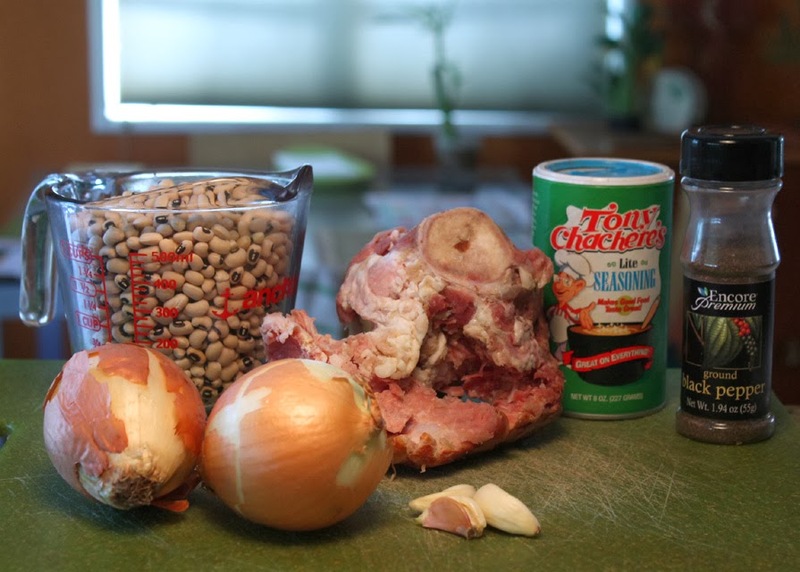 Call it Southern-style, Low Country, or Soul Food, and by adding a ham hock or a leftover ham bone, you raise a humble pot of beans to a whole other flavor profile. If you are cheap like me then you froze the ham bone from that less-than-a-dollar per pound holiday Shank Half Ham. And for the upcoming New Year's Day Celebration, my Black-eyed Peas just need some rice to make the Southern traditional Hoppin' Johns. You can cook some rice with the finished Black-eyed Peas (about 20 minutes of simmering, covered) or steam the rice separately and add the Black-eyed Peas when you are ready to celebrate. You'll be surprised by all the ham you can pull off the bone, after it has simmered in the pot of beans for a couple of hours. 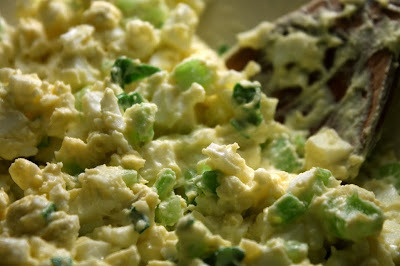 Just watch my latest recipe video of Soul Food-Style Black-eyed Peas with Ham to see what I mean. This recipe can be applied to most any type of dried beans: black, white, red, pinto, lima, green pea, lentil, etc. Only the cooking time will vary -- beans like pinto and black beans need 3 to 4 hours, while lentils cook through in half an hour. Make sure to read the package directions for cooking times. Surprisingly Black-eyed Peas are more expensive than the average legume, over a dollar and a half per pound -- at least in Los Angeles grocery stores. 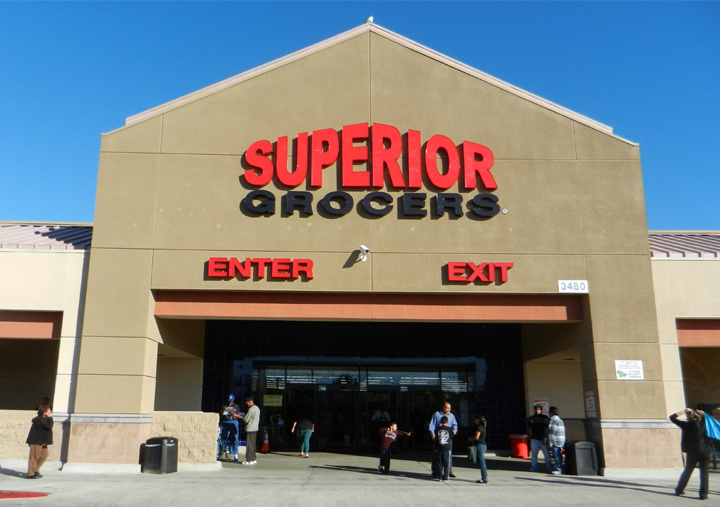 Maybe they are cheaper in the South? 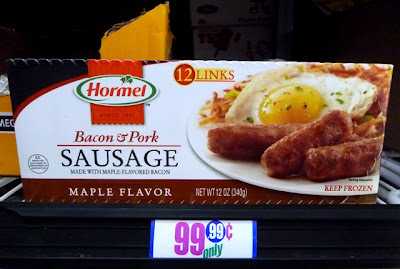 Well, I got mine with a dollar coupon from Ralphs, so my recipe hits all my cheap$kate price points. 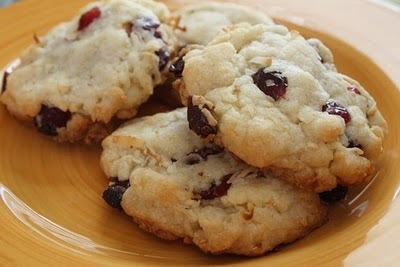 Even at full price you'll get half a dozen servings, so it's still a tasty budget recipe. 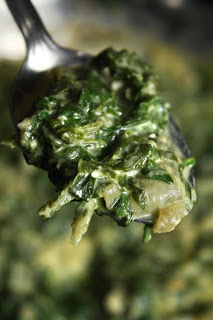 I also used an onion, one bay leaf, and some chopped garlic -- all inexpensive ingredients. My friend, Miss Patti, showed me how to make Cajun-Style Vegetarian Red Beans. 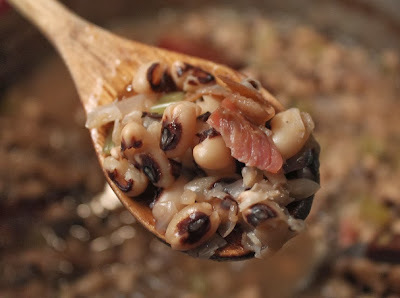 So if you are meat averse, then click here to see that video recipe post, so you make Black-eyed Peas your way. For your next homemade pot of beans on a cold winter day, go with The 99 Cent Chef's smoked pork addition -- you'll drive your household crazy with the tantalizing aroma that comes with slow cooking Soul Food-Style Black-eyed Peas with Ham. Play it here, video runs 2 minutes, 21 seconds. 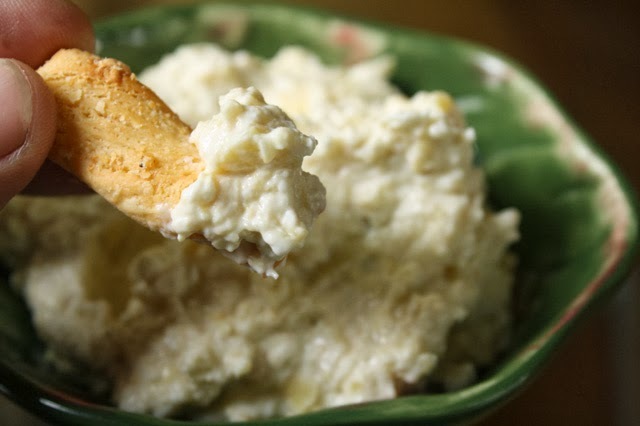 1 leftover ham bone or ham hock - You are going for the smoked pork flavor. Okay to use 4 slices of bacon cut into 1 inch pieces. You can brown the bacon first and add the amount of bacon fat you feel comfortable with. 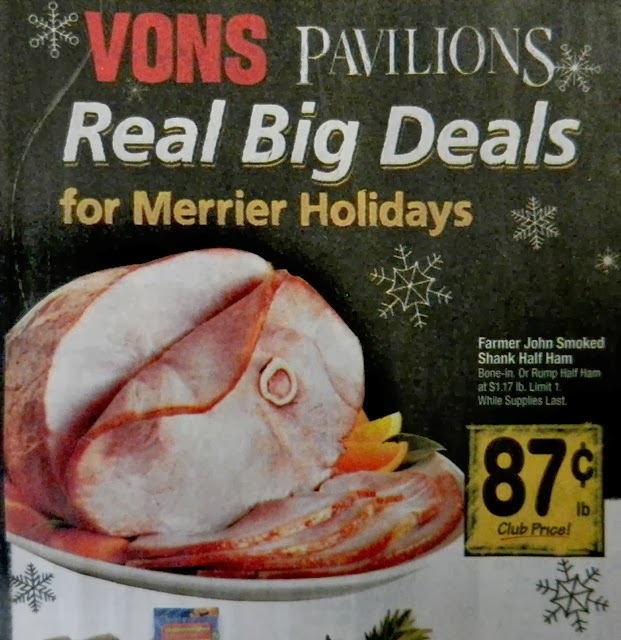 Also, okay to use a small ham steak cut into cubes, or any cheap smoked meat. 1 whole large onion - or 2 small onions, white or yellow. 8 cups of water - add more if needed during cooking. Salt and pepper to taste - or any favorite seasoned salt, like Creole Seasoning. 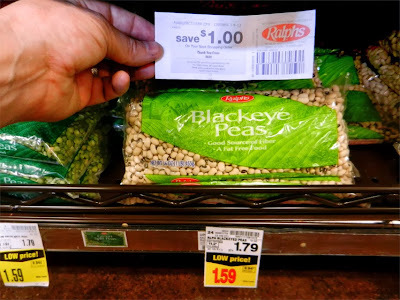 Check black-eyed peas for pebbles or discolored peas and discard. Rinse off back-eyed peas. 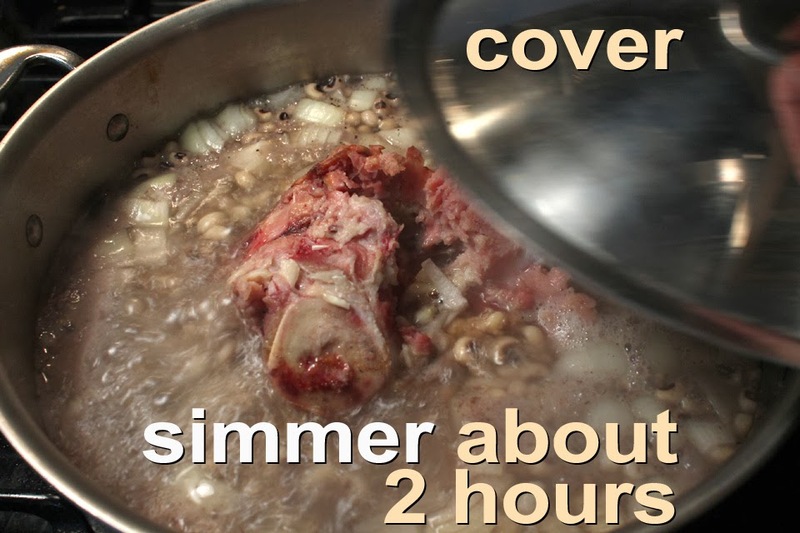 Add black-eyed peas and ham bone, ham hock, or bacon, to a large pot with 8 cups of water. 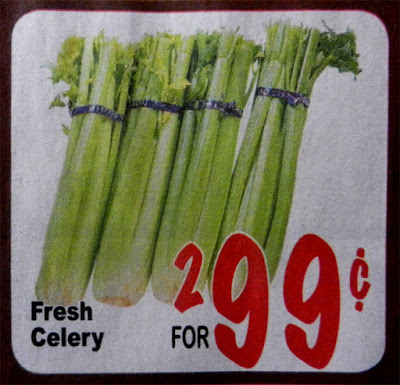 Chop onion and celery into 1 inch pieces. Add to pot of peas. Season with salt and pepper or Cajun Seasoning. Black-eyed Peas should be tender. 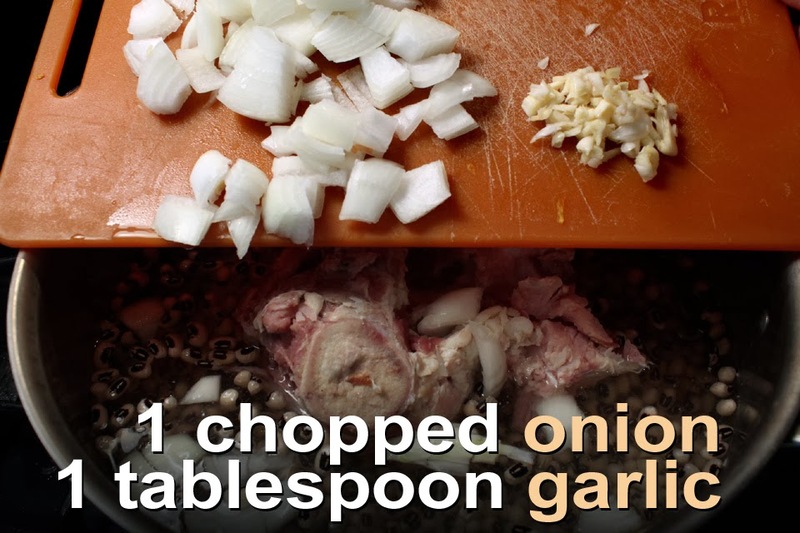 Remove ham bone or ham hock (no need to take out bacon) and peel off the meat. Add the ham pieces back to the pot, mix well, and low simmer uncovered another half hour. That's it. Pretty simple to make and you can use this recipe for any of your favorite dried legumes, including: red, white or black beans, pinto, lentils and green peas. Cooking time will vary as some beans need 3 to 4 hours of low simmering. Dried lentils cook the fastest - about 30 minutes. 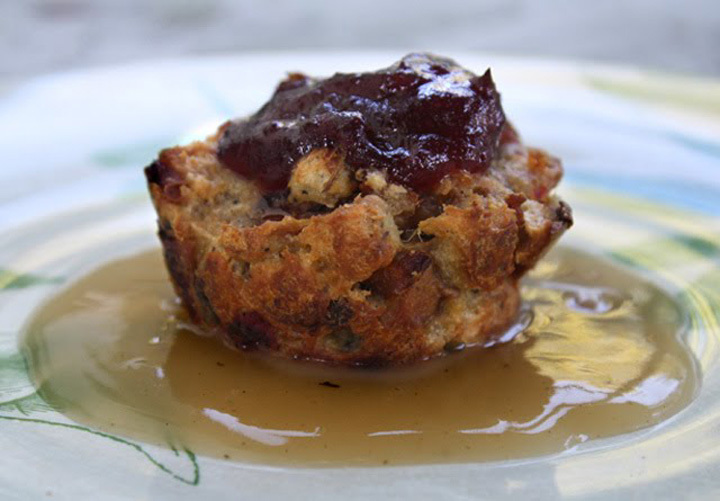 But seriously, last year I posted my version of a Turkey with Stuffing recipe, click here to read all about it. 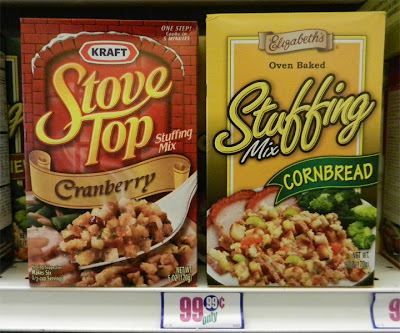 Not only is there a recipe that features my Mother-in-laws decedent sausage stuffing, but I made a video below for you. And it's done in my movie technique of stop motion animation to boot. Of course, I have some more sides for you, just click on any of the following names: Green Beans with Almonds, Whiskey Yams with Brown Sugar Pumpkin Seeds, Squash Tomatoes and Onions, Brussels Sprouts in Sour Cream, Roasted Potatoes with Carrots, Honey Orange Glazed Carrots, Collard Greens with Molasses, Asparagus and Red Potato Salad, and a Pear and Spinach Salad with Creamy Dressing. And don't forget the appetizers like: Artichoke Dip, Black Olive Tapenade with Crostinis, Bacon Wrapped Dates with Cream Cheese, and Roasted Asparagus Wrapped in Salami. 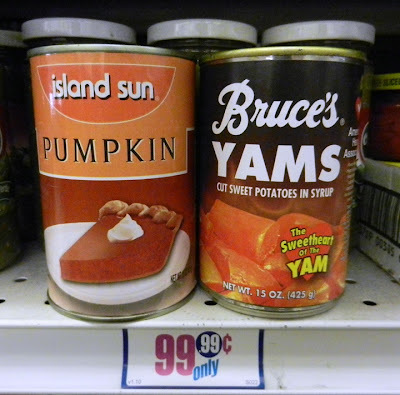 Now is the time to hit up your local grocery for cans of pumpkin, or, if you are cheap like me, less expensive cans of sweet potato. You can use either, as the taste is identically delicious. My latest Deal of the Day review is a lucha libre battle royale between two 99 cent chicken burritos. 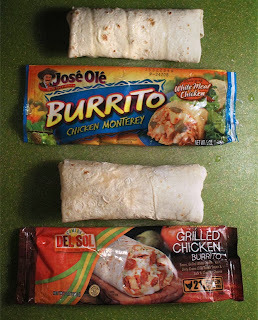 In this twofer blogpost, Jose Ole Burrito Chicken Monterey goes mano-a-mano against a Del Sol Grilled Chicken Burrito. 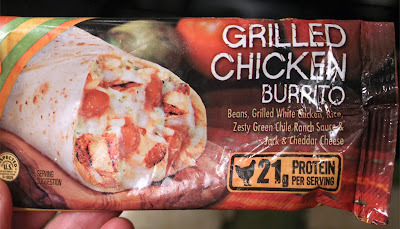 Does a flamboyant green chile and cheese flavored Jose Ole Burrito Chicken Monterey body slam the more traditional rice and bean stuffed Del Sol Grilled Chicken Burrito? Which burrito will be unmasked as the loser in this Deal of the Day? And with a rating of 1 to 9, 9 being best, who will be declared the champ? 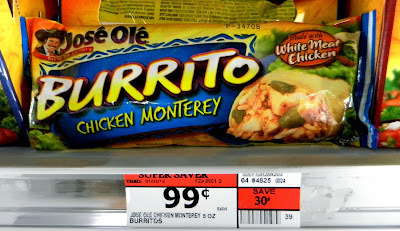 For the first round let me introduce the Jose Ole Burrito Chicken Monterey. It's the smaller of the two at just 5 ounces. However I will not deduct points, it's all about flavor in this Mexican fast food smackdown. First off, after a 2 to 3 minute microwave, the burrito must be named for a hot cheesy filling of Monterey cheese and green chiles. You are immediately walloped with the savory combination. However, there is a weak smattering of rice mixed in the yummy sauce. The flour tortilla is fine, no points lost for the wrapping. But the Achilles' heel is the white meat chicken. 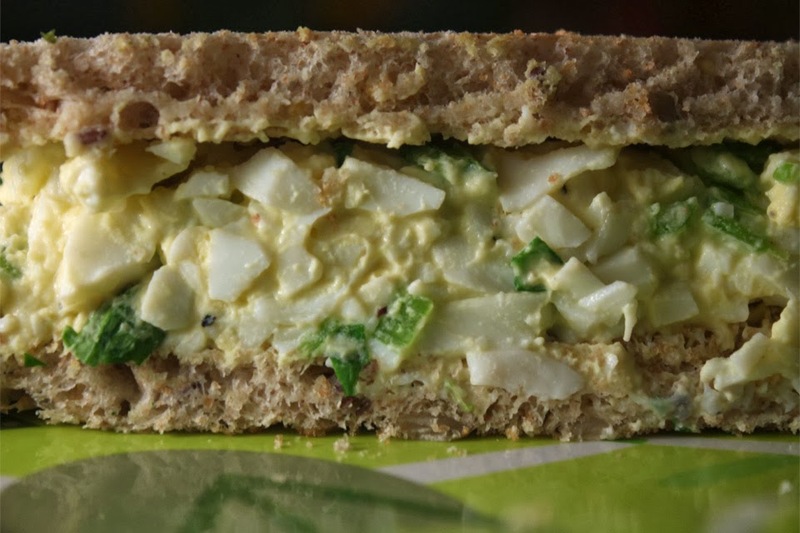 While there is actually plenty of poultry cubes, it's made from a processed loaf. 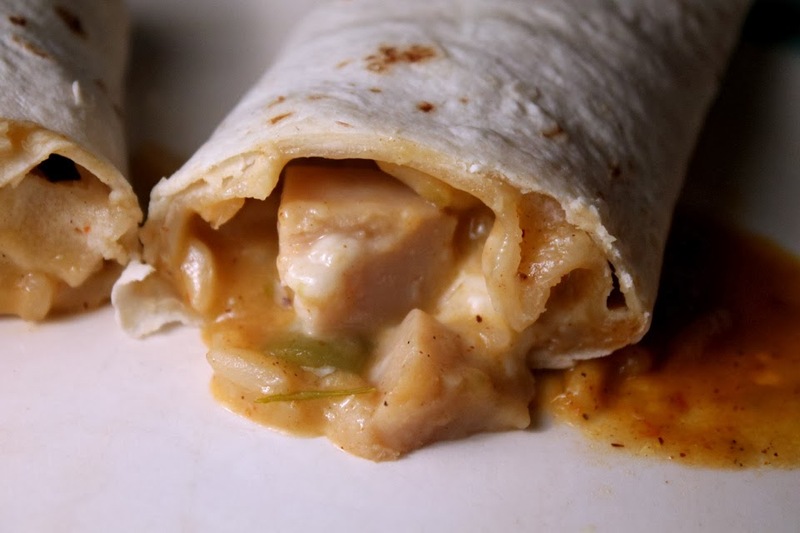 For such a serious foul this chicken burrito gets an immediate 3 point deduction. 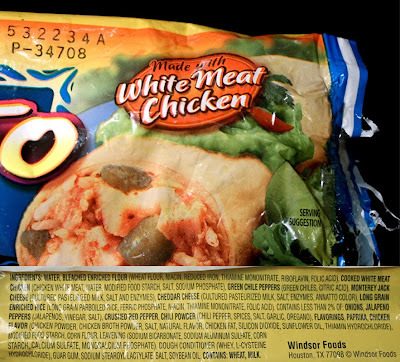 So while I like the chile and cheese sauce, Jose Ole Burrito Chicken Monterey throws in the towel because of the fake processed chicken pieces. 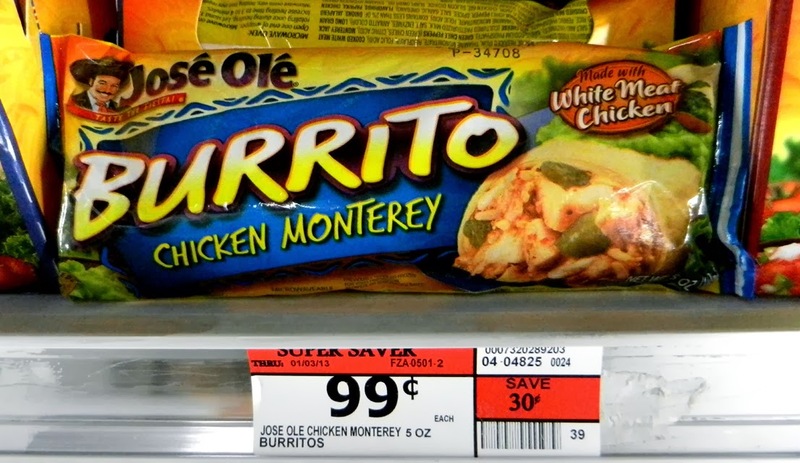 On a Deal of the Day dining scale of 1 to 9, 9 being best, I give the Jose Ole Burrito Chicken Monterey a 4 count. Next up, please welcome to the wrestling ring a Del Sol Grilled Chicken Burrito. This is a stripped down burrito. No no fancy show off moves or glittery attire here, just beans, rice, and chicken. At 7 ounces this fat burrito body slams you to the mat and keeps you in a headscissors armlock of Mexican traditional flavors. 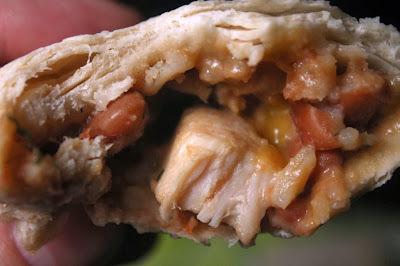 I like the use of whole pinto beans with refried beans. 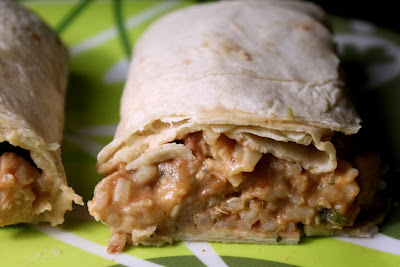 Usually Mexican frozen fare mushes pinto beans into a paste. And there is a good balance of rice to beans. 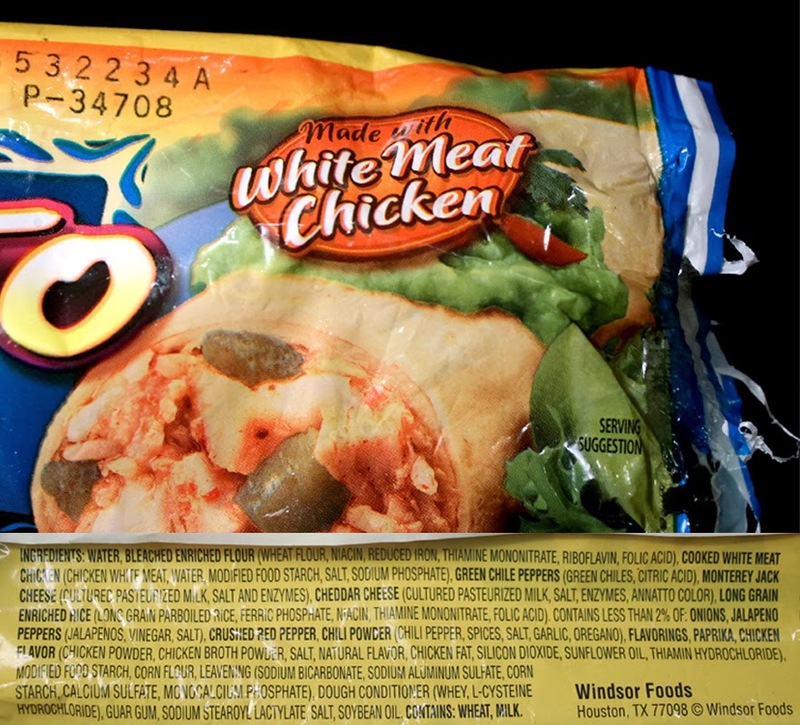 On the package cover, cheese and a "zesty green chile ranch sauce" is listed. The top billing status is deceiving though. 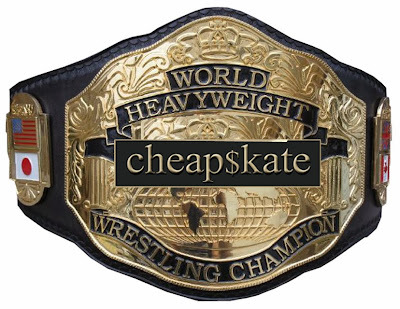 As a tag team member, it enters the fight too late and only plays a minor role. The flour tortilla holds it's own, with no fancy moves. 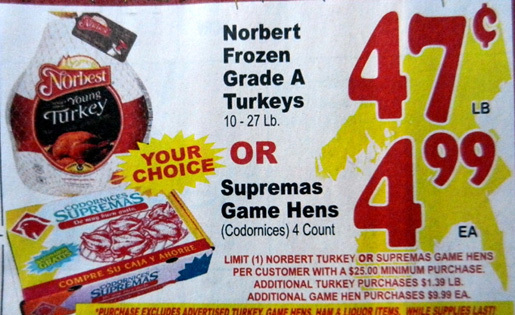 But the winning wrestler's hold is the use real white meat chicken! The pieces are small but moist and tasty. Overall the Del Sol Grilled Chicken Burrito is a simple opponent, it's been knocked around and is a bit slow in the ring, but it delivers the knockout punch. 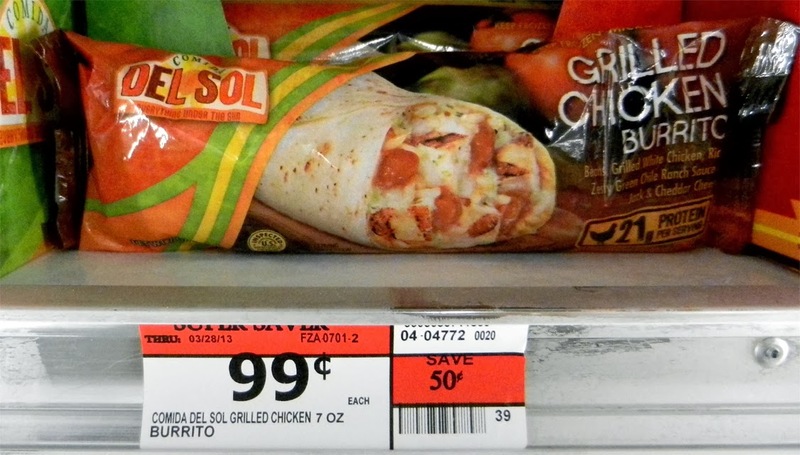 So on the Cheap$kate Chef's Deal of the Day dining scale of 1 to 9, 9 being best, I declare Del Sol's Grilled Chicken Burrito the champ, with a rating of 7! Congratulations Del Sol Grilled Chicken Burrito, and wear your 99 Cent Chef Cheap$kate wrestling winners belt proudly. 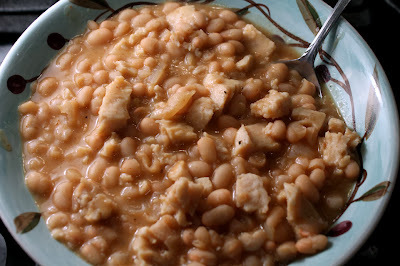 If you've put in long hours at work and want to just chow down quickly, but deliciously, then try out my Quick White Bean & Chicken Chili. 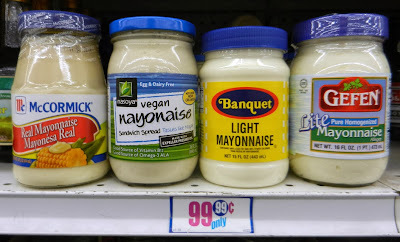 And it's all made with easily attainable 99c only Store ingredients. And cheap enough from regular markets or other discount stores. White beans are milder than most other beans. So they won't overpower white meat breast chunks in a can. But canned beans can be very salty, even the ones I got that are "in light seasoning." 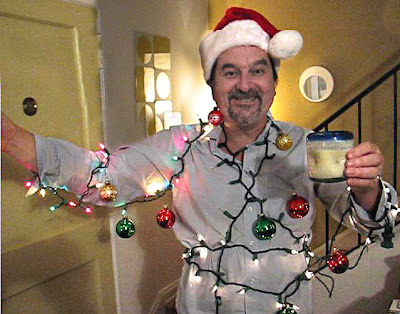 To see a version where I lighten the sodium load, be sure to read Hindsight at the end of this post. If you've never had chicken from a can, it's really quite tasty. The can size is small, like canned tuna fish, but convenient for single servings. And the texture is similar to canned tuna. 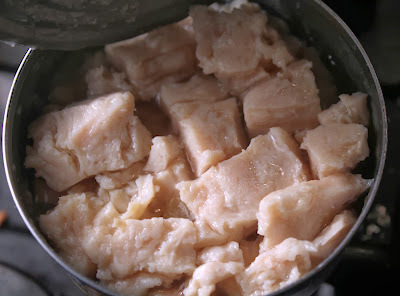 Usually chunks of breast meat is used. And believe it or not it tastes like real breast meat, not a processed loaf.. Also use canned chicken to make a fantastic chicken salad with my Tuna Salad with Green Olives recipe by clicking here. Dried or fresh chilis are the main flavor for typical beef and bean chili. I always have a bottle of deep red dried chili powder in my spice rack. Since this is a single serving (at most 2) you can use less than a teaspoon. And I like to add a little chopped onion, garlic, and some black pepper. 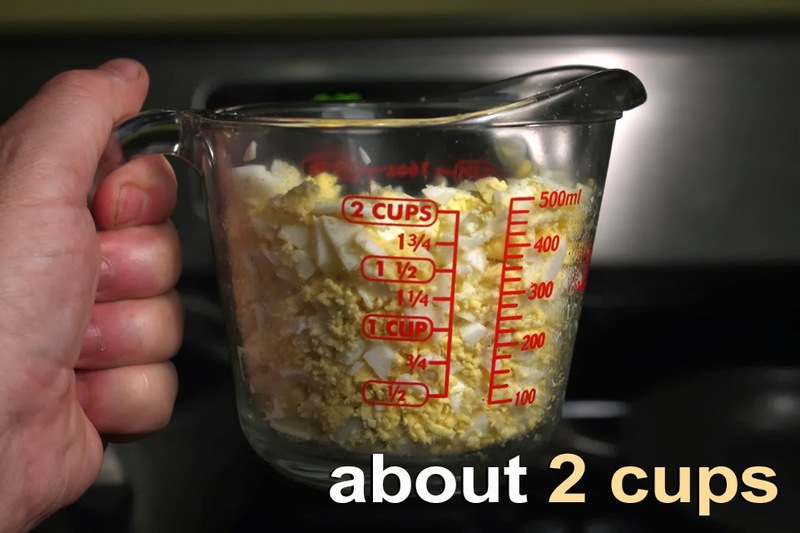 That's barely six ingredients, and common enough that I already have most of them in my cupboard. So read on and try my easy to make Quick White Bean & Chicken Chili. 5 ounce can of Chicken - very similar to a can of tuna. 1/2 small onion - any color. Use a 1/4 of a large or medium. Roughly chop onion and fresh garlic clove (I used garlic from a jar for convenience.) Add oil to a pot over medium heat. Saute onion for about 3 minutes. Add chopped garlic and cook another minute. 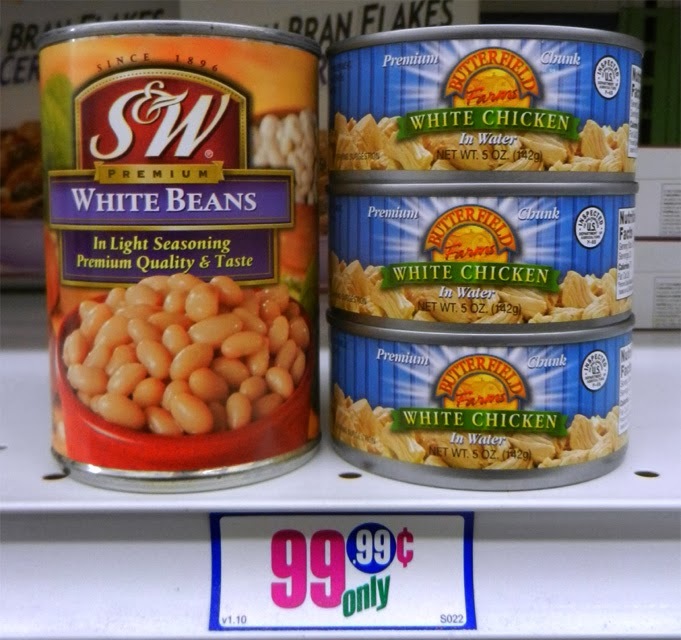 Pour in a can of white beans. 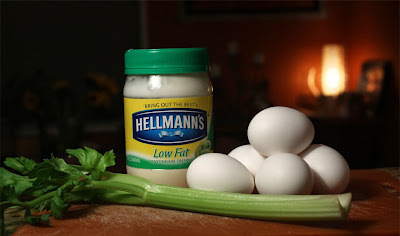 Add a can of chicken. Lightly stir to mix well - I like to keep the chili chunky. Sprinkle on 1/2 teaspoon of chili powder and add black pepper to taste. 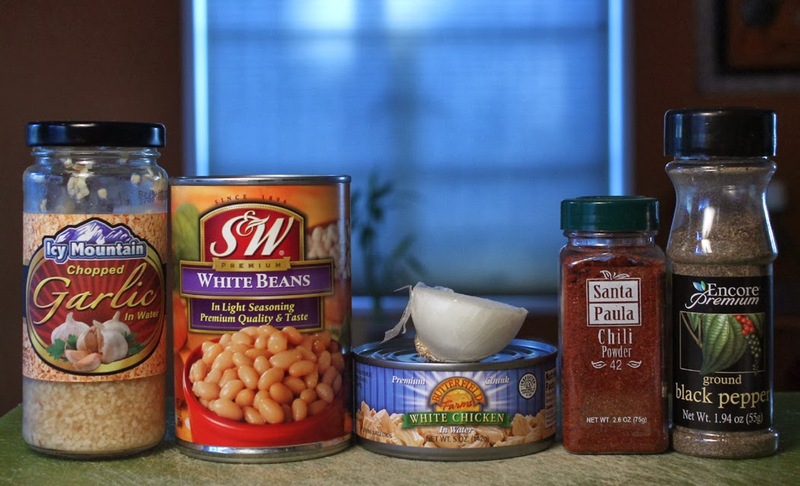 Heat Quick White Bean & Chicken Chili until just starting to boil. 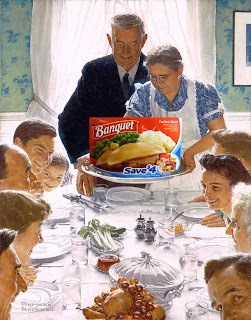 Turn off heat and ready to serve. 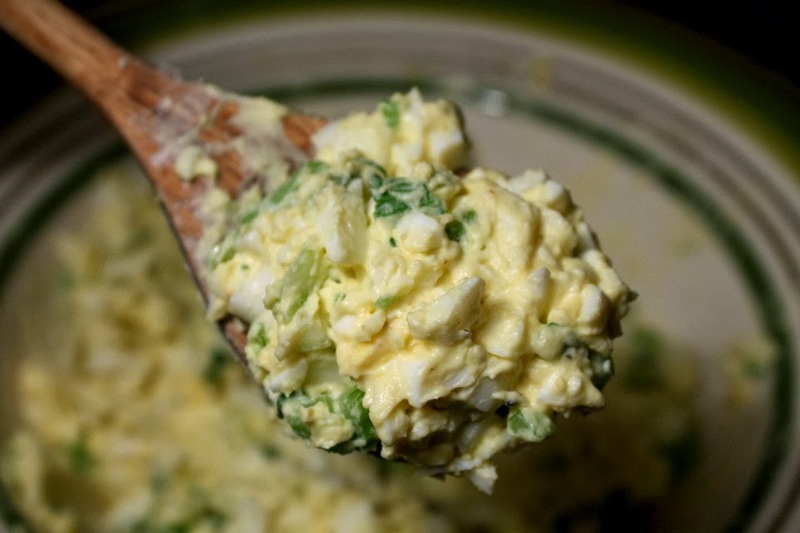 For extra flavor sprinkle on some chopped onion, shredded or sliced cheese, and spice it up with your favorite hot sauce. Now that's a lot of salt, using 2 canned main ingredients. That's why you see no additional salt in my cheap$kate recipe. The salt in this recipe mainly comes from the white beans. If you can find low sodium beans that's best. Even though the label of my beans said "light in seasonings" it still tasted very salty. Taste a teaspoon of sauce from your purchased brand to check salt level. It's easy enough to dump beans in a strainer and rinse off about half the sauce, that should lighten the saline flavor. Or if you don't have a strainer add beans to a large bowl, add a couple cups of water, swish around and pour off 3/4's of the liquid. You should add half a cup of water to replace the sauce. Now you can follow the directions above.